Most men would love to wear a ruby ring. There seems to be no shortage of rings to choose from but, buying a men's ring without being aware of some vital pieces of information is unwise. Rubies are not cheap, it is important that you get what you pay for. 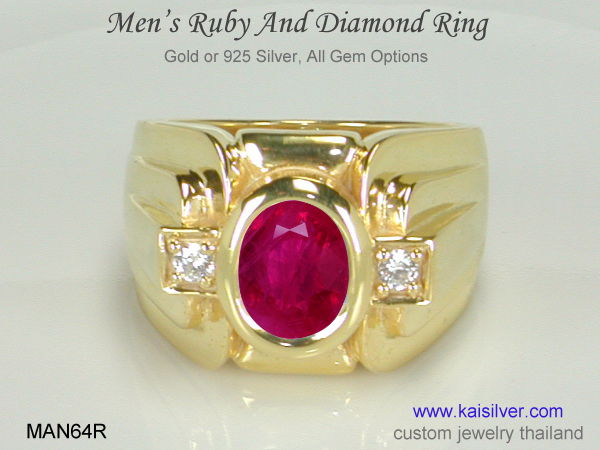 While we will talk about the Kaisilver MAN64r ruby ring for men in this report, we will also highlight some important issues related to ruby gemstones. This men's ruby diamond ring is set with a natural 9x7mm oval ruby gemstone. Synthetic rubies and man made imitations, are cheap and can cost a 100 times less than their natural counterparts. At Kaisilver we procure rough ruby gems from Myanmar (Burma) and Africa (generally Mozambique). Burmese rubies carry a premium price tag, this was the main source of rubies for many centuries. When selecting a ruby gemstone ring, pay attention to the color, clarity, size and cut of the gemstone. While you can specifically request for a Burmese ruby when ordering a Kaisilver men's ruby ring, we would suggest that you go by gem authenticity and appearance. It is quite possible that a Mozambique ruby within the same budget, provides better color, clarity and size as compared to a ruby from Burma. Now the most important and generally confusing issue about ruby gemstones. Let's put it simply without getting into technical jargon. Most rubies and sapphires (more than 90%) are heated to improve their color and appearance. This treatment is accepted by experts and does not compromise on the value or durability of the gemstone. You would be aware that rubies are extremely hard and tough. Diamonds are the hardest stones to be used in jewelry, they are rated 10 (Mohs scale), ruby and sapphire come a close second - they are rated 9. 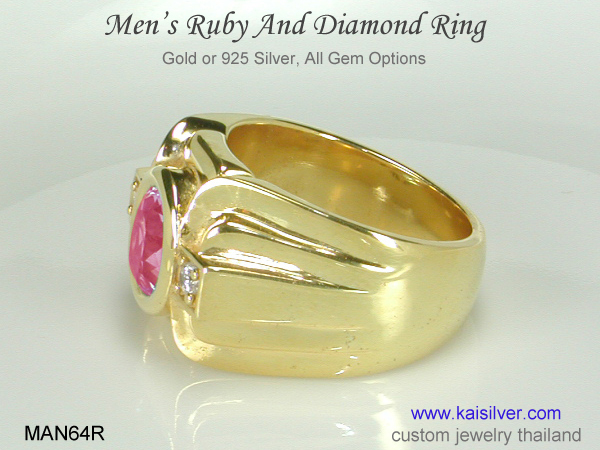 A gold or 925 silver men's ruby ring from Kaisilver, will be set with a natural heated ruby gemstone. We will provide you a gem authentication certificate for the gem. There are other forms of treatment being applied to rubies in recent years, some of these are beryllium heated rubies and glass filled or fissure filled rubies. The problem with these other ruby treatments is that, they reduce the value of the gems and are generally unstable. For example, a fissure or glass filled ruby is in reality composed of, ruby with solidified glass the stone loses much of its toughness. A glass filled ruby can cost up 200 times less, as compared to a heated ruby gemstone. This is the reason why, you must insist on a gem authentication certificate when buying a men's ruby ring. 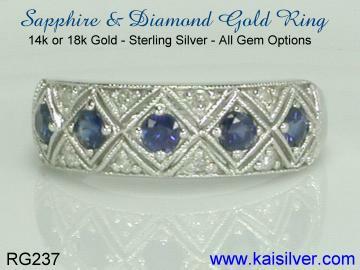 Unlike most jewelers, we at Kaisilver give equal importance and attention to gold and sterling silver jewelry. You could order the MAN64r ruby men's ring in 14k or 18k gold or sterling silver. The same team of highly skilled artisans work on rings crafted in both metals. The quality of the ruby gemstones remains the same for the gold and silver rings. If you decide to go for the men's silver ruby ring, we would recommend that the ring be left without any plating. This is because a plated 925 silver ring will always show a wear off on the plating after a while. But if you still prefer to have your men's sterling silver ruby ring plated, we provide options for white rhodium, yellow gold and pink gold platings. The ring is set with a natural 9x7mm oval ruby gemstone. We provide a gem authentication certificate at no extra charge. This is NOT a glass filled or fissure filled ruby gemstone. The diamonds in this men's ruby ring are 2.5mm rounds. The size and shape of the ruby and diamonds can be personalized to your preference. The men's gold ring is available in 14k or 18k yellow, white or pink gold. The same superior standards are maintained for the gold and silver ruby ring. The ring has durability features built into the design and structure. We provide an optimized metal weight of 20-25 grams for the ring. Larger ring sizes might require additional metal weight. 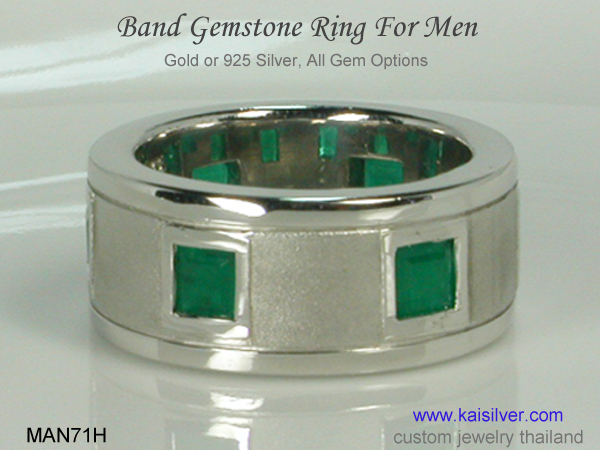 You can pick the gemstone of your choice for the MAN64r ring. Important Notes: The design of the MAN64r ring can be modified to suit your requirements. We place no restriction on choice of gemstone, so you could pick the design concept and request for the ring to be crafted with any gemstone of your choice. Let us know if you prefer to have a solid ruby men's ring with no scooping done inside the band. Such a design concept can call for additional metal weight depending on, the ring size. 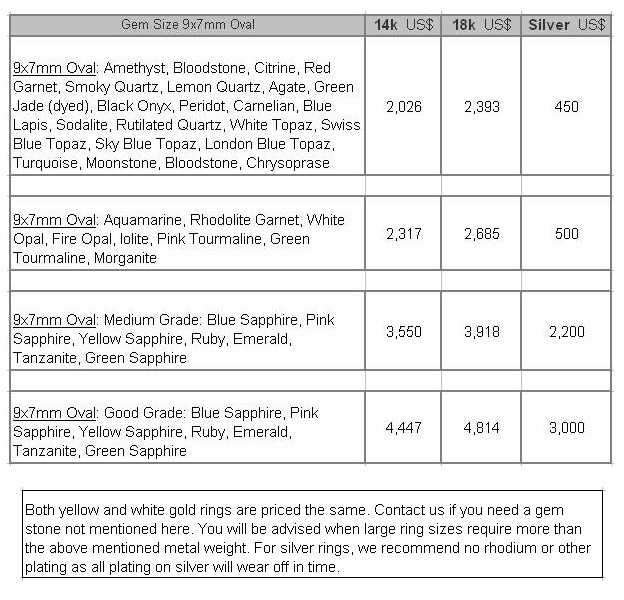 We will let you know if your gold or silver ruby gemstone ring needs additional metal weight before, you commit to the purchase. A small portion under the gemstone will be kept open to facilitate light to enter the gem. This will also make it easier for you to clean the bottom of the gemstone. Kaisilver: Widely accepted as the most preferred online source for fine custom made jewelry, we at Kaisilver craft all types of jewelry in gold and 925 sterling silver. You could pick any design from our online resources and request for it to be made in gold or silver, the dimensions and size details can be specified by you. We have an unmatched reach as far as gemstone procurement and cutting is concerned, this is precisely why we place no limitations on your choice of gemstones. You can also send us your design sketches or images to be custom made. Discuss your queries and requirements with the support experts at sales@kaisilver.com they will be glad to help you without, any selling pressure. Production time is 4 to 6 weeks from the date of order confirmation and receipt of payment. We accept payment through Paypal and Western Union but, recommend Paypal as it is safer for you and us. Let us know which mode of payment you prefer and we will provide details for the same. Your order will ship through FEDEX with web tracking.